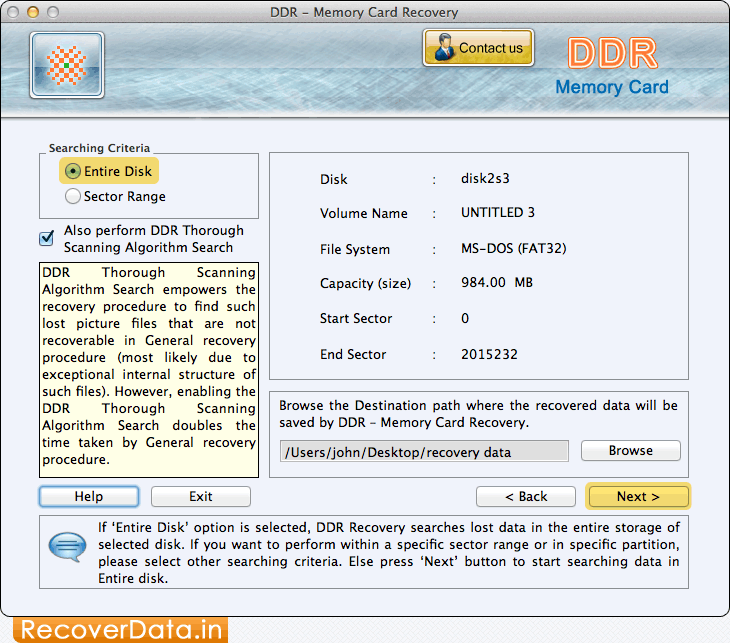 Don’t worry, Advanced Memory Card Data Recovery software for Apple Macintosh OS X has solutions for your problem. MAC Memory Card Data Retrieval application helps you to get back your lost precious memories, mp3 songs, holiday snapshots and video clips from inaccessible MMC cards. Memory Card Recovery Softwware for Mac provides data recovery from various types of memory cards (MMC card, SD card, CF card, xD picture card and more). Utility supports data recovery from all major manufactures of memory cards including Olympus, Sony, SanDisk, Transcends, Fujifilm, Kingmax, Panasonic and other types of cards brands available in the market. Recovers your lost precious digital photographs, images and snaps from damaged SD card of all capacity. Restore missing, misplaced audio files, video files and picture files by using advanced disk scanning techniques. Retrieve deleted photo gallery, movies and audio/video songs. Regain accidentally lost digital pictures, valuable photographs and other important data in less time. Utility instantly retrieve your deleted birthday photographs, images without affecting their originalities.